I’m so happy for you! Or am I…? Have you ever gushed over another woman’s success while feeling a tiny bit inadequate? I know I have - I have been genuinely happy for someone while thinking “I wish I had that, I should be doing more, how come she is achieving so much?” Unfortunately this is usually about other women. It is so easy to compare ourselves to each other; our bodies, our jobs, our parenting, our relationships. I think that Social media exacerbates the problem, we have ‘fear of missing out’. We see other women’s good days online, but not often their bad. We see friends on holidays, cuddling gorgeous babies and looking stunning. We don't see the days they can't get out of bed, have to deal with toddler tantrums and battle with their support underwear. In creating ‘Dressing Up’ I have stumbled upon many other fashion writers and plus size bloggers that are just incredible. I don’t see them as a threat, I see them as women I can learn from who have valuable experiences to share. 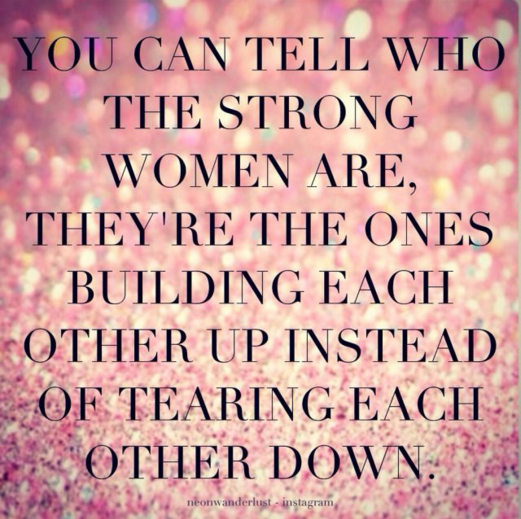 Successful women have so much to teach us and if you want to be successful yourself, they are the perfect companions. Defining success is difficult because it is different for everyone. I don't believe it is 'having it all'. For me it is more about feelings of achievement and that I am coping with the things I care about (being a parent/wife/friend, working at something, being able to walk through the house without tripping on baby paraphernalia!) I have a couple of tricks that help me feel successful when it's all falling down around my ears. How to silence the ‘little voice of doubt’ and feel like a success. Never mind the end goal or that it might get difficult, just take one step towards your goal/project today. I thrive on that feeling of ‘moving forward’ even if it is redecorating a room or cleaning out the filing cabinet! Just start. Keep people around you who make you feel good about yourself and who encourage you. You have no time for anything else- you're too busy being awesome! Yes I'm talking to you. When you meet a woman you feel is successful, find out her story. How did she get where she is, what is she working on at the moment? What gets her excited? (Or, "What do you do to get your baby to sleep!?") You never know where such conversations might lead. My biggest inspirations often come after having a coffee and a chat with an awesome woman. Remind yourself of all the things that you have going for you and discuss what you are grateful for. When you appreciate the support or ideas of others, tell them. I have so many of these. ‘Not my problem’ when I am taking on other people’s angst, ‘Be you- wear the jewels!’ when I am afraid to stand out. ‘Deal with today’ when I am worrying about what to write on the blog next month, next year...where will I be in 10 years...what if the polar ice caps melt...rein it in! When you are feeling like you are miles from your goal, ask others how they think you’re going. Those that love you know you best, and will soon tell you if they think you’re slacking! Chances are, everything is fine and it is all in your head. Speak to yourself the same way you would speak to your best friend, with kindness and understanding. Positive thoughts inspire positive action. This can be tricky at first but keep at it! Change “I am rubbish at this, I’ll never get it!” to “Okay I took another step today towards my goal.” ‘Should’ is a word that we use when we feel we are lacking, try to avoid it. Be one of the women in the quotes below, be empowering. A huge thank you to the women in my life that support me everyday. My very own cheer squad- you know who you are, mwah!